By Mike Smith: Saul Canelo Alvarez’s December 15 fight against WBA ‘regular’ super middleweight champion Rocky Fielding is still looking for a broadcast outlet for their bout at Madison Square Garden in New York. Canelo’s promoters at Golden Boy Promotions are looking at one of these options according to Dan Rafael: DAZN, Facebook Watch and Showtime. De La Hoya expects to make an announcement about the Canelo-Fielding broadcast outlet by next week. Fortunately for Canelo and Golden Boy, his next fight against Fielding isn’t a big PPV match, since it could potentially hurt sales for the fight if they couldn’t find a broadcast outlet soon. Although HBO still has an option on Canelo’s fight in December, it’s up in the air whether they’ll bother airing his fight against little known Fielding (27-1, 15 KOs). This is not a high profile pay-per-view worthy match that guarantees huge money and a lot of viewers. Fielding, 31, isn’t well known enough by casual boxing fans to make this a must-see fight. It’s more of a stay busy fight for Canelo (50-1-2, 34 KOs), who needs a mental and physical break after his tough second fight against Gennady Golovkin that took place last month on September 15 in Las Vegas, Nevada. “In the next couple of weeks we will have a major announcement and it will be great for boxing, great for Canelo and great for Golden Boy. We are talking to everybody,” Golden Boy Promotions CEO Oscar De La Hoya said to ESPN.com. Canelo’s popularity makes it much easier for De La Hoya and Golden Boy to search around for different broadcasters for his next fight than it would be if he were just an average world class fighter. Canelo is the biggest money fighter in Northern America. He’s in demand by the different broadcast outlets. They know that if they sign Canelo, they can bring in huge money and subscribers. Golden Boy isn’t just looking for a home for Canelo though. They also want to find a network for their many other fighters in their Golden Boy stable like Ryan Garcia, Jaime Munguia, Angel Acosta, Vergil Ortiz Jr., Rey Vargas, Alberto Machado, Jesus Rojas, Romero Duno, Alexis Rocha, David Lemieux, Gary ‘Spike’ O’Sullivan and Oscar Negrete. Canelo, 28, has been with HBO for three years since leaving Showtime in 2015. When HBO decided to end their broadcasting of boxing at the end of 2018, it put Golden Boy and Canelo in a situation where they needed to find a new home. It’s possible that Canelo would have left HBO anyway at the end of 2018, as there are so many different outlets for him to be seen by. Recently boxing fans had complained on social media about the quality of HBO’s cards not being what it once was. If Canelo had stayed with HBO, he might have wound up isolating himself on a network that is losing viewers for boxing. However, Canelo could potentially hurt himself if he goes to a fledgling streaming platform like DAZN before they have signed enough subscribers for his fights to be seen by a lot of boxing fans. Even if DAZN paid Canelo a lot of money to have his fights streamed by them, he might wind up with less money due to the fewer fans. HBO has the option of televising Canelo’s December 15 fight against the 31-year-old Fielding. 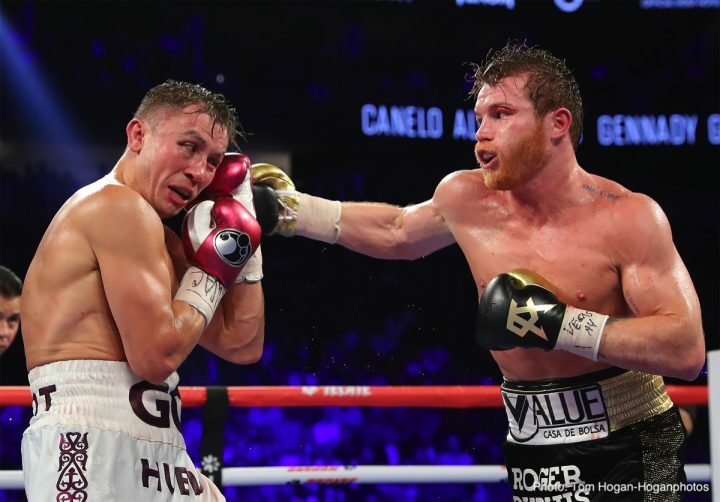 Golden Boy Promotions can still to look around for another broadcaster for the Canelo-Fielding fight, but HBO would have the option of meeting that offer if they choose, according to Dan Rafael. Again, whether HBO would be willing to do that at this point is unclear. Since HBO is getting out of the boxing business at the end of 2018, there’s little point in them attempting to match an offer from another broadcaster for the Canelo vs. Fielding fight. This is not going to be a big money maker of a fight. De La Hoya says that he’s not interested in a co-promotional deal with Top Rank to televise Canelo’s fights on ESPN or Matchroom Boxing USA promoter Eddie Hearn to stream his fights on DAZN. If Canelo is going to fight on DAZN, Golden Boy Promotions will go straight to the source by approaching DAZN rather than using Matchroom as the middle man. That’s probably not going to make Hearn too happy, considering he’s been talking about wanting to sign Canelo to his Matchroom stable in a co-promotional deal. De La Hoya and Golden Boy aren’t interested in sharing their flagship fighter Canelo with Matchroom or Bob Arum of Top Rank. Arum has an exclusive deal with ESPN, which might rule out Canelo fighting on that network unless they’re interested in having Top Rank and Golden Boy fighters. De La Hoya is still interested in whatever offers DAZN can make for Canelo’s services. The streaming platform just finished an 8-year, $1 billion deal with Matchroom Boxing to have their fighters streamed on their network. With that kind of money being thrown at a promotional company that comprised of largely British fighters, Golden Boy might get lucky and get a big offer made to Canelo. He’s clearly a more sure thing to bring in subscribers by the millions to DAZN than Eddie Hearn’s Matchroom stable. Hearn still hasn’t signed one star to his Matchroom stable that U.S casual boxing fans are interested in high numbers. DAZN would do well having Canelo on their platform for the next 10 years or so, but it’s up to them whether they’re willing to out-bid the other networks trying to sign the popular Mexican star. DAZN will need to come up with a big enough offer for Canelo to be willing to risk hurting his career by going to a new platform that might not have the same reach as networks like Showtime, CBS, Fox and ESPN. Canelo was with Showtime in the past, so there’s a chance that network could come up with the money to re-sign him. Showtime paid Floyd Mayweather Jr. huge money in the final years of his career before he retired. Facebook is also an option for Canelo due to the big money they have. Canelo would be seen potentially by millions of boxing fans if he were to sign up with Facebook. Ultimately, it comes down to how much Facebook is willing to offer Canelo.